You can learn a lot about a river by digging in the mud. Insects that live in the mud tell a story about the health of the river. Midges, crayfish and aquatic beetles are just a few examples of these bugs. The St. Clair Region Conservation Authority checks the Sydenham River to see what bugs live in the mud. Different types of bugs tell scientists whether or not the river is clean. Some bugs can only live here if the water is clean. Other bugs can live in water that is polluted. Organisms (life-forms like the bugs) that live in the river bottom are called "benthic flora". 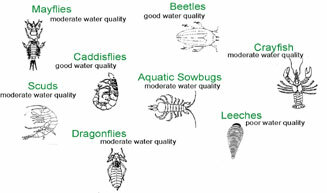 This diagram shows some local river bugs and the levels of clean water they need to survive.